Founder and Senior Pastor of the Willow Creek Community Church in South Barrington, Illinois, USA. He is also the creator of the Global Leadership Summit. 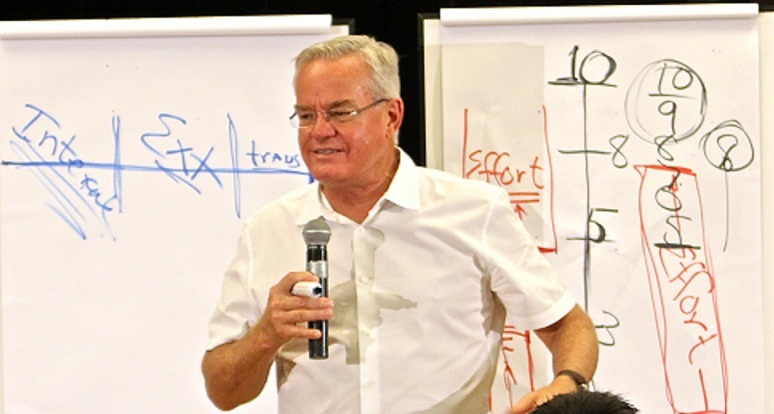 Pastor Hybels is an author of a number of books, especially on the subject of Christian leadership. How would you define a leader of excellence either in business or within a Christian environment? Leaders have to be moving groups of people in a God-honoring direction. I often refer to leaders as people who move people or causes from here to there. And the “there” is wherever God wants something to go. Leaders have to be clear vision casters. They have to build teams. They have to inspire and motivate, they have to solve problems. So there are a lot of skills required in making a good leader, but the main understanding of what a leader does is that he takes a cause for a group of people and moves them from here to there. There are great leaders in the world, in politics, in science, business, etc., but they do not necessarily pursue the Christian faith. What would you say to them? From a private conviction standpoint, I wish every person on Planet Earth knew God in a personal way. I wish everyone could experience His love and His guidance, and so that’s not a problem because that’s not going to happen, at least not in my lifetime. So even though someone’s not a Christian, I’d want to help them be as good a leader as they’re capable of being. In other words, I’ve got to say everybody wins when a leader gets better. If a principal at a school –even a public school- gets better, everybody wins. The teachers win, the students win, the parents win, you see. And if the leader of an athletic team, a coach, gets better, then the players win and the players’ families win and the school wins. If someone in government –doesn’t even have to be a Christian government- but if a leader in government gets better, everybody wins. So I’m trying to raise the level of leadership in any position, in any arena of influence anywhere in the world. The Church is the hope of the world. But what does the church of today need to do to truly act as “the hope of the world”? The Church is the hope of the world when it’s working right. It’s not the hope of the world just when it shows up and holds services. It’s the hope of the world when it’s being the hands and feet of Christ in the world, when it’s helping people far from God find faith, when it’s helping people who know God progress to their full spiritual potential. It’s when it finds lonely people and enfolds them into the Biblical community. It’s when the people in the Church begin to serve the poor and fix what’s broken in society and overturn a fraction of systemic injustice. So the Church has to be doing a lot of things right for it to really credibly be viewed as the hope of the world. But when a church is working right and when it really is the hands and feet of Christ in the community, there’s nothing like it. There’s a power, there’s something supernatural released into that community that no other institution in society can compare with. ← What Happens when the Lights Go out?